Three of PMM ’s trusted product testers, Des Davies, Stephen Wright and John Hall, give their verdicts on Ring’s RIL3900HP MAGflex Pivot inspection lamp. On delivery of the inspection lamp, which was already fully charged, I went about my daily tasks in the workshop. The lamp operated for around four hours and it took around three hours to recharge. In an ideal world, I’d want the lamp to last longer than four hours, as it is something that I would normally use for most of the working day. 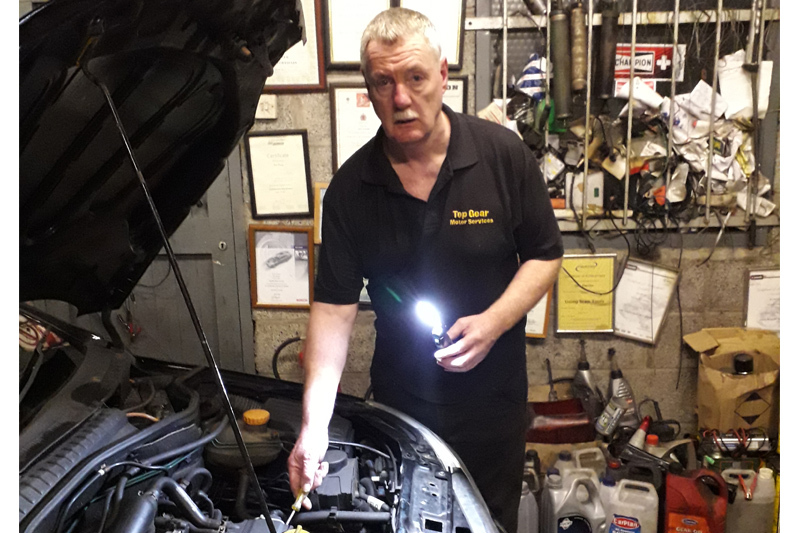 In any case, the lamp had brilliant lighting for checking components and items, with a concentrated beam helping with pre-MOT checks and servicing. It was slim enough to place in between the road wheel spokes to check the brake pads, on the hard-to-reach engine components (behind the inlet manifolds) and many other confined spaces. The product can be rotated and tilted to very good angles, especially when working under the bonnet on the engine and under the dashboard. It worked really well in very confined spaces where my normal lamp cannot get to, as it is too large and cumbersome. I found the lamp very tactile and ergonomic; it was quite small and light. The strong magnet at the bottom of the lamp and the two at the rear were effective when attaching the lamp to metal surfaces. It is quite robust for such a small and light lamp; I dropped it a few times and it still works well. It certainly gets into places I can’t, and it does what it says on the tin. I would say that it’s the best lamp I have used; a very powerful light, small, light and robust enough for the workshop environment. When unpacking the lamp, I initially noticed how well it was packed into its compact box. The charging indicator is great; not only does it tell you that the light is charging, but it informs you how long before it needs charging again. On first use, the light felt very comfortable in the hand. Although it’s small in size, it has a sizeable light output. This, coupled with the magnet, means you can position it just about anywhere to give you great hands-free working. What was also surprising was how long it lasted before needing a recharge. The main light works on a thumb wheel switch and there is a small LED at the tip of the light, which was ideal in getting into small areas to check things out. Overall, the LED was a great addition to any toolbox, and a great product from Ring. When the lamp arrived, I was initially shocked by how small, lightweight, versatile and easy to use it was. As I started to use it, I realised that if you’re working under a dashboard or down the side of an engine replacing a cam belt, you don’t need a flood of light, but a good amount of light that can be controlled to show you what you’re working on and doesn’t blind you. The small torch on the end of the wand is very useful for checking brake pads behind a road wheel, as it shows just the pad – not the wheel or disc – whilst concentrating the light on the item you want to see. Its bright 400 lumen wand is impressive; it’s controllable through varying angles and is compact, with several strong magnets that allow it to be positioned to free up your hands. The lamp is also small enough to carry in your pocket and use as a general inspection lamp, with a good operating time and quick re-charge. With its usefulness, this tool has replaced my other tools and is now the go to tool for any job. Previous : Noise From Rear Whilst Driving?